Chamebel presented a new hollow section in aluminium for window frames. Metallization gained popularity as a way to protect steel window frames after WWII. 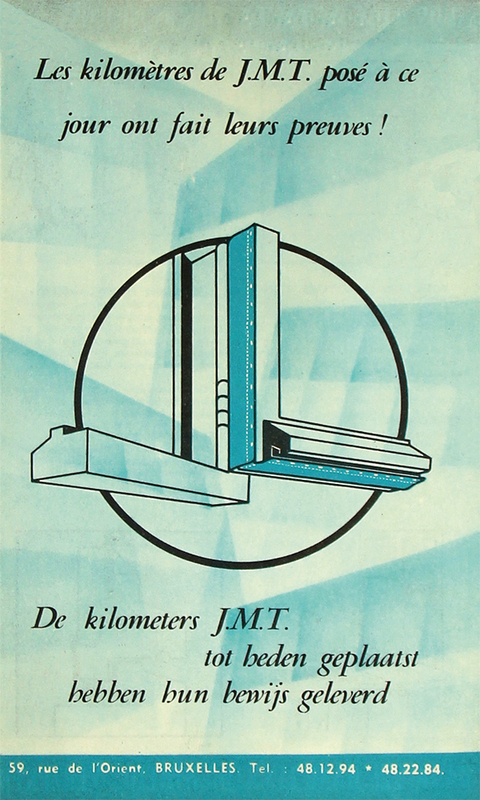 The first advertisements on aluminium window frames appeared in the architectural press in Belgium. The Belgian norm NBN 208 established a series of standardized sizes for window frames. The window frames manufactured by the Ateliers Tantôt Frères had a double or triple rabbet. Chamebel promoted the Wallspan system for curtain walls. The worldwide production of aluminium had increased from 264,000 tons in 1930 to 3,300,000 tons in 1957. CIMUR (Comité d’Information pour le Développement des panneaux de façade et des murs-rideaux) was founded in France. In approx. 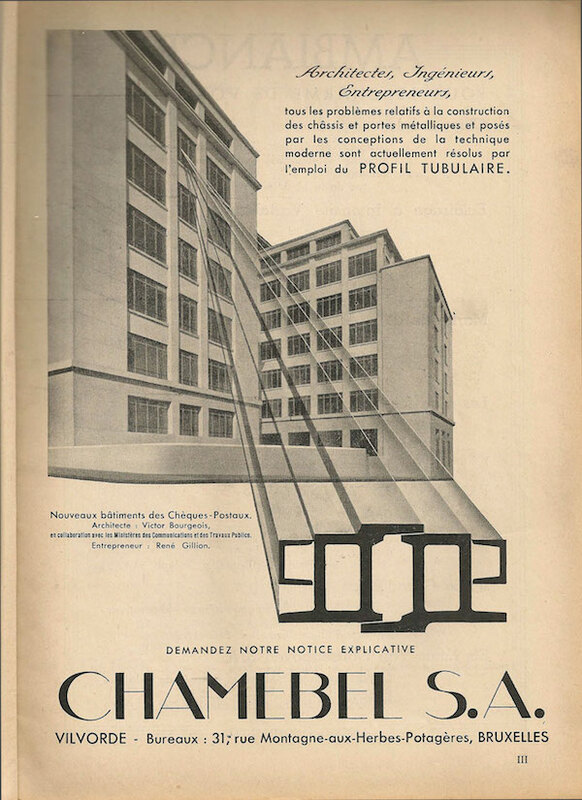 1960, Chamebel made a promotion film Comfort and light showing the production of aluminium and steel window frames. The BBRI compiled a technical note on how to correctly make and install window frames. The Unified Technical Specifications STS 36 on metal window frames were published. The BBRI reported on research on the functional characteristics and the watertightness of window frames: mostly timber window frames were subjected to testing. In the post-war period, window frames changed mainly in two respects, namely, the material of which they were made and the functional design of the sections. Before the Second World War, window frames usually were made out of wood and, in the interwar period, steel as well. The principal new material of the post-war period was aluminium. It gained popularity quite quickly thanks to its adaptability, which opened new formal possibilities. The rise of the new material was accompanied by the development of new techniques to protect the frames against atmospheric and chemical agents. These metal windows were produced mechanically: this entailed standardization but also facilitated the introduction over time of more features, like double and triple rabbets and thermal breaks. The large companies and manufacturers of window frames, like the Belgian firms Chamebel and La Brugeoise & Nivelles, pioneered new functional and technical designs of, and methods of manufacturing, window frames, including the use of extruded aluminium sections, automated production processes, and the development of glass curtain walls. Nevertheless, contemporary research reports reveal that in general, manufacturers had difficulty creating perfectly weather- and watertight window frames in the post-war period. A common way to classify window frames is by the way they open. In addition to being fixed, window frames can rotate or pivot around a vertical or horizontal axis, or slide (for example, vertical or horizontal sliding sash windows). Rotating windows can be hinged at the side (casement windows, which are the most commonly used kind in house building in Belgium), at the top (awning windows), or at the bottom (hopper windows). Holding the middle between awning or hopper windows and horizontally pivoting windows are so-called projecting windows. These were relatively common in the post-war period, yet hardly applied today. Different types of windows could be combined within one large frame. While it is common to combine several opening mechanism within the same window today (e.g. tilt and turn windows), this was rare in the post-war period. As for the dimensions of window frames, practically all sizes were possible. In order to rationalize the production range, a Belgian norm NBN 208 was issued in 1950 that established a series of standardized sizes. Standards were based on the most common sizes at that time, also taking into account contemporary building practices (e.g. usual heights of rooms and window sills, lighting and ventilation conditions) and the techniques for producing window frames. Standard widths ranged from 60 and 260 cm and heights from 60 to 160 cm, creating 31 standard sizes. The norm also stipulated the sizes of the openings in which these windows were to fit: depending on the material of the frame and the presence of a recess in the masonry wall, the openings had to be up to 8 cm wider and 4 cm higher than the frames. Complementing the standards for window frames, the Belgian norm NBN 227 regulated sizes of door openings: the door leaf (in wood or metal) was to be either 73 or 83 cm wide and 206 cm high, while the openings were 80 or 90 cm wide and 210 cm high. While NBN 208 only considered timber, metal (probably referring to steel), and concrete window frames, other materials were being used in the post-war period for windows frames, e.g. aluminium, cast iron, bronze, copper, stainless steel, and even PVC, which was available before 1975. Combinations also were available, for instance a timber frame covered on its exterior with aluminium, or a combination of a fixed timber frame with metal sashes. Yet the most commonly used materials for window frames in post-war housing were timber, steel, and aluminium. For centuries, wood has been the principal material for window frames, and it was used in solid pieces, as opposed to hollow metal sections. In 1958, the journal Architecture published a themed issue on wood (n° 23-24) containing an article by J. Kennis (of the National Bureau for Documentation on Wood) about the most important wood species used for joinery and woodwork. Kennis listed 18 species used for exterior applications, and he discussed the weight, durability class, shrinkage, hardness, colour, texture, and pattern for each type. The Belgian Building Research Institute (BBRI) also studied timber window frames, focusing on their functional aspects. For instance, in 1962 the BBRI’s technical committee on joinery compiled a technical note on how to correctly make and install windows, including illustrated recommendations for the position and construction of rabbets, lintels, sills, and fixings for common types of timber window frames. In general, however, most articles and writings about window frames in the post-war period dealt with metal (and especially aluminium) instead of the more traditional wood. Steel window frames became popular during the interwar period. Steel (and later also aluminium) was promoted because of its high strength and therefore more slender sections, which allowed larger glass surfaces. Recurrent references were made in literature to the average proportion of the surface occupied by the steel frame (7%) and the glazing (93%). Often also the comparison was made between wood and steel: steel window frames allowed an increase of the glazed surface with 18 to 35% in comparison with timber frames. Other advantages of steel windows were their dimensional stability, precision due to the mechanical production, incombustibility, resistance to rot, and an unlimited service life – when properly maintained, at least. The high sensitivity to rust was the major drawback of steel windows. The use of hot-rolled or cold-formed steel sections, welded together so as to be perfectly even and homogenous, permitted a great variety in forms. The formal possibilities were even more increased with the rise of aluminium for window frames. Aluminium window frames were a new phenomenon in the post-war period. While the industrial production of aluminium dates back to the 19th century, its use for architectural purposes was very limited until after the Second World War, when the reorganization of the military and aviation industry enabled a transfer of the technology to applications in architecture and construction. When the term aluminium is used, it usually refers to an aluminium alloy, containing also minor quantities of other chemical elements and impurities. The Belgian Centre for Documentation and Information on Construction (CEDOC) determined the precise composition of an AlMgSi-alloy that was very suitable for architectural purposes like window frames; it contained not only aluminium, magnesium, and silicon, but also manganese, iron, copper, and zinc. Despite the lower tensile strength and stiffness of aluminium than of steel (Young’s modulus of 70,000 N/mm² for aluminium compared to 210,000 N/mm² for steel), aluminium was highly appreciated because of its lower weight (2700 kg/m³ compared to 7800 kg/m³ for steel). While the AlMgSi-alloy had good resistance to chemicals, it could be damaged by direct contact with copper, brass, lead, and steel, so the fittings and hardware had to be executed in other materials. Also, cement and chalk left permanent stains, even when the surface was protected, for instance by anodic oxidation. When protected properly, aluminium resisted corrosion and was very maintenance-friendly, requiring no paint or periodic treatments. Another appealing feature of aluminium was the unlimited formal possibilities: any type of profile could be created, including very complex forms. With aluminium, tubular, hollow sections could be made by means of an extrusion process, which was extensively used to create window frames. In 1967, in his handbook on metal windows, J. Wieland pointed to the fact that, thanks to the high levels of precision of the production process, it was also easier to incorporate a plastic sealant profile (e.g. neoprene) and to create thermal-break sections, in order to overcome the high thermal conductivity of aluminium. Very soon after their introduction in Belgian architecture (the first advertisements in the architectural press appeared in 1947), aluminium window frames began to be used on a large scale. Although (slightly) more expensive than steel, aluminium was used for diverse applications in buildings: window and door frames, curtain walls, roof covers, façade cladding, structural elements, etc. The worldwide production of aluminium increased from 264,000 tons in 1930 to 3,300,000 tons in 1957. In the same year, the first iconic example of aluminium architecture in Belgium was finished: the headquarters of the Prévoyance Sociale in Saint-Josse-ten-Noode by architect Hugo Van Kuyck. The façade of the building was produced by two major Belgian metallurgical companies: La Brugeoise & Nivelles was responsible for the aluminium façade frame, and the windows were produced by Chamebel. In 1958, the World’s Fair in Brussels proved another highpoint for aluminium in architectural history in Belgium, with applications in dozens of pavilions, including the cladding of World’s Fair symbol, the Atomium. 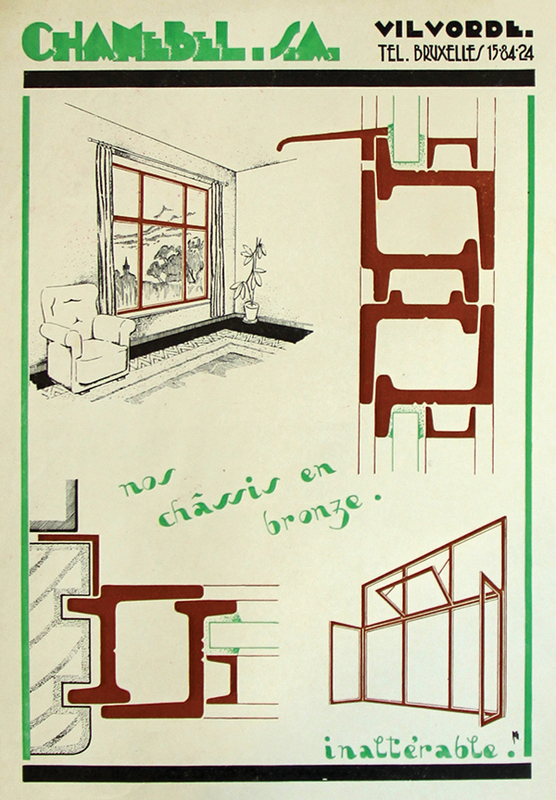 From the 150 advertisements for window frames that appeared in the architectural press between 1945 and 1970, one could say that aluminium was clearly taking over: aluminium was explicitly mentioned in almost half of the advertisements. Steel windows continued to be on the market, as they were mentioned in approximately a quarter of the ads. Mentioned in 10% or less were, in descending order, bronze, wood, stainless steel, cast iron, and, finally, copper. Yet a 1970 BBRI research report on the weather- and waterproofness of window frames gives a different impression. Assuming BBRI tested the most commonly used types, wood dominated: 38 timber window frames were subjected to testing, followed by three combining timber and aluminium, one in aluminium, one in steel, one in PVC, and one combining various materials (wood, aluminium, steel, and plastic). The technical and functional detailing of the tested frames was sometimes advanced: almost all windows had a double or triple rabbet, one window even had a quadruple rabbet. To keep out rain and wind, sealing profiles were used in 27 of the tested window frames. One of the most important requirements for metal window frames is to be protected against damage from water, chemical agents, etc. The traditional way to protect steel windows was by applying a layer of anti-rust paint in the factory and two layers of finish paint after installation. To maintain the protection, a new layer of paint had to be applied every eight to ten years. In the early post-war period, metallization gained popularity as a way to protect the steel because it was more durable than paint. After the steel sections were properly cleaned and prepared by sandblasting, a thin layer of melted metal (usually zinc) was sprayed on with a spray gun. The amount of metal that was applied depended on the desired level of protection: the Belgian norm NBN 755 on metallization issued in 1968 described a minimum of 250 gr/m², yet commonly 600 to 700 gr/m² was applied. After the metallization was completed, the elements could be assembled and coated with a finish paint. Two older techniques to protect steel that were still used in the post-war period, yet on a much smaller scale, were Parkerizing (also called phosphating) and electro-galvanization. Phosphating involved submerging the element into a high-temperature bath with iron and manganese phosphate, transforming its surface into a matte black, rust-proof oxide layer. For electro-galvanization, the steel frames were submerged in a high-temperature bath with a metal solution through which an electric current was run, which caused the metal particles (usually zinc) to adhere to the steel. For aluminium windows, other protection techniques were developed. The most effective and widely used technique was anodic or electrolytic oxidation, also called anodizing. Developed in the 1920s and used increasingly after World War II, anodizing was executed by submerging the frames in successive baths. The fully-automated process of anodizing window frames was shown in a promotion film made for Chamebel entitled ‘Comfort and light’ (a film by Jan Botermans, produced by Sofedi under the supervision of G. A. Magnel Jr., around 1960). Chamebel had installed a series of large baths in which the aluminium window frames were successively degreased, chemically stripped, neutralized, anodized (in a bath electrified with direct current under low voltages), and, if desired, coloured (in black, bronze, or gold). Thanks to the anodized coating, aluminium window frames resisted atmospheric corrosion very well. Nevertheless caution was necessary, especially during the installation of the window frames, as the coating could be damaged by scratches or contact with cement. To keep the coating intact for the long term, it was necessary to remove dust and dirt regularly, for instance by simply cleaning the windows with water. A type of window frame that has come to symbolize post-war architecture and construction techniques is the glass curtain wall. It is a non-loadbearing façade system, put in front of the structure, which carries only its own dead weight and transmits wind forces to the loadbearing structure. Usually incorporating large glazed surfaces, these curtain walls enabled more light to penetrate the building. The frame of the curtain wall was often made out of hollow rectangular sections of extruded aluminium, which were filled with window frames. The fixings and connections needed to be weather- and waterproof, and allow thermal expansion in all directions. Numerous studies examined the detailing and performance of curtain walls, for instance on thermal behavior (in Architecture, 1962, n° 49) and connections to a building’s structure (in the BBRI journal, October 1963). 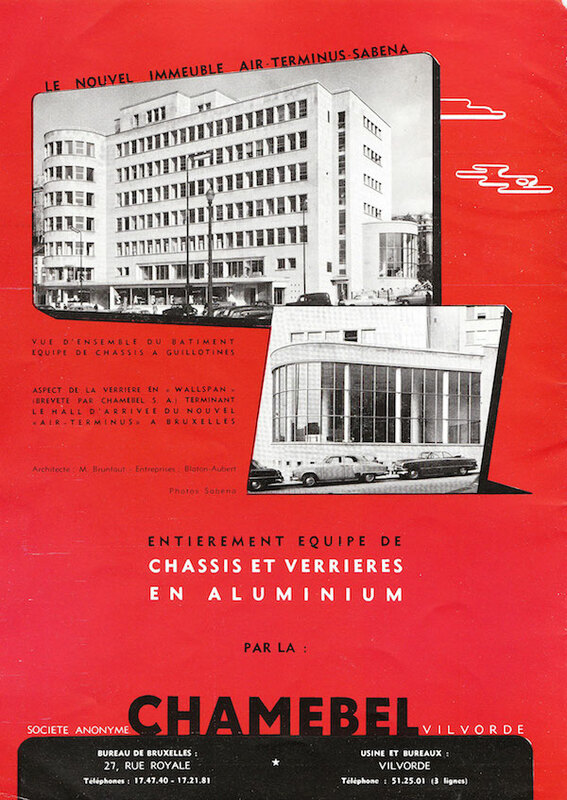 The latter study was based on a brochure edited by CIMUR, the Comité d’Information pour le Développement des panneaux de façade et des murs-rideaux, which was founded in France in 1958 and united the federations of building materials (steel, wood, asbestos cement, aluminium, and glass) with the carpenters’ federation. Although no similar professional organization existed in Belgium, Belgian companies did take part in the development of the curtain wall and created their own systems. 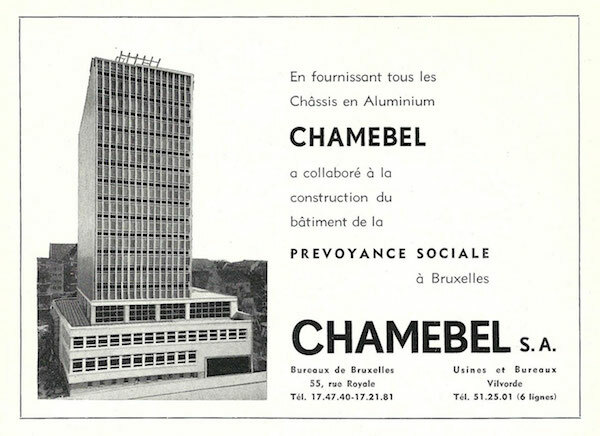 The first Belgian system was developed in the early 1950s: in 1954, Chamebel published advertisements for the Air Terminus Sabena building in Brussels (located in front of the central railway station), in which Chamebel’s aluminium Wallspan system was applied. Other well-known applications of the Wallspan system are the International Rogier Centre in Saint-Josse-ten-Noode (‘Martini tower’, Jacques Cuisinier, 1957-1962, demolished), the national airport building in Zaventem (Maxime Brunfaut, Georges Bontinck, and Joseph Moutschen, 1956-1958), and the Administrative Centre for the city of Antwerp (Renaat Braem, 1952-1967). Many other companies followed the example of Chamebel. First the larger companies started manufacturing curtain walls, e.g. the Société Métallurgique Enghien-Saint Eloi (advertising its curtain walls from 1958 on), Moens & Co (from 1960), and La Brugeoise & Nivelles (from 1961). From 1962 onwards many smaller companies also included curtain walls in their advertisements. Interesting is the terminology that was used: apparently in search of a proper denomination, Chamebel originally referred to the Wallspan system as ‘verrière’ or ‘grote glaswand’. 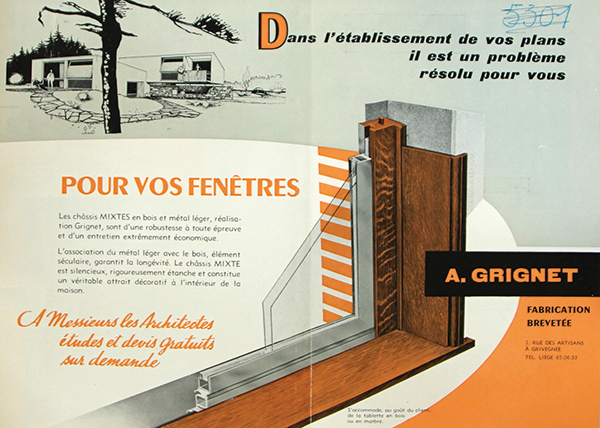 ‘Mur écran’ (literally ‘wall screen’) was the most common term in the second half of the 1950s, before ‘curtain wall’ or ‘mur-rideau’ became widely accepted in Belgium, in the early 1960s. Curtain walls were mainly applied in office, high-rise, and public buildings. In residential buildings, more modest façade frames were applied, rather than full blown curtain walls. 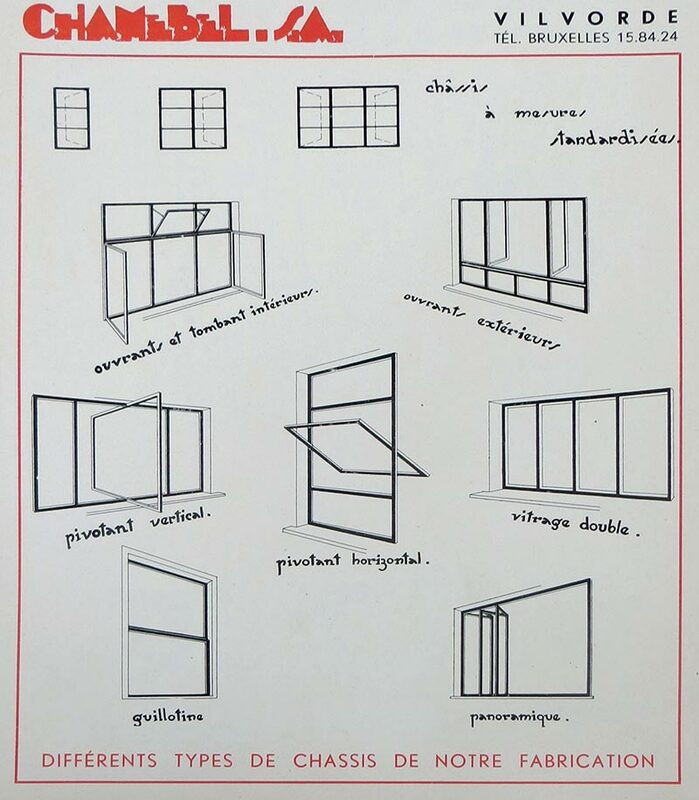 With a few exceptions, the post-war architectural journals provided little technical information about, and few details and physical properties of, window frames. Illustrative of this are Bouwen en Wonen’s three semi-themed issues on aluminium (1957, n° 12; 1960, n° 4; 1960, n° 8), which contained almost no technical or scientific information. On the other hand, the already mentioned 1970 BBRI research report (n° 13) dealt with functional characteristics and the watertightness of window frames. The report was based on testing of numerous window frames at the BBRI laboratory in Limelette. The test results were, however, hardly positive: almost none of the frames complied with the functional requirements described in the Unified Technical Specifications STS 36, published in 1965. The most recurrent issues had to do with weak cross sections and corners, hinges and locks, sealing strips, rabbets, glazing beads, water drains, and imprecise fabrication or assembly. Furthermore, BBRI concluded that the manufacturers apparently, until then, were hardly interested or aware of proper wind- and watertight design rules. Company brochures, catalogues, and advertisements published by the manufacturers also included very little technical information. Only in very rare cases were values for tensile and bending resistance, weight, or thermal conductivity given. The range of companies involved with the production and installation of window frames is very diverse. It includes some of the major Belgian metallurgical factories, a few large international firms, as well as many small, local (family) businesses, from ironworkers to carpenter contractors. Most companies specialized in one material except when it came to metals: window frames in steel, aluminium, and even bronze and stainless steel were often processed within the same company. A close reading of post-war architectural journals and company brochures (some of them unfortunately lack dates) preserved in the Archives d’Architecture Moderne revealed over 60 companies connected with window frames. The largest group was clearly those producing or installing metal window frames. Only a few of the companies produced timber, plastic, or composite window frames. A small number of companies focused less on the material than on specific applications or components, for instance shop windows, partition walls, or hardware. Taking a closer look at the manufacturers of metal window frames, a number of them demonstrated a specific concern with technical details, e.g. Tantôt, Francotte, La Brugeoise & Nivelles, and Chamebel. For instance, the Ateliers Tantôt Frères focused on watertightness: already in 1950, their window frames had a double or triple rabbet. The company, founded in 1870 and merged into Les Ateliers Tantôt Menzel Réunies in the early 1950s, also marketed the Joint Métal Tantôt JMT. This was comprised of a metal strip and a plastic sealant that was applied to wooden windows to hermetically close them. Joseph Francotte (whose company was called J. Francotte & Co, Francochass, or SaFraCo) paid much attention to official regulations and prescriptions. His was one of the few companies whose publicity mentioned that their window frames complied with the Unified Technical Specifications STS 36 of 1965, their curtain walls were calculated for the wind loads described in the norm NBN 460.01 (issued in July 1960), and their anodizing process met the quality requirements of the European Wrought Aluminium Association (EWAA). La Brugeoise & Nivelles (BN), founded in 1956, was a merger of two large metallurgical companies. BN was mostly known for its railroad cars and industrial machinery. With all its in-house experience and technical equipment, it is not surprising that BN and its subdivision Fametal, also developed an entire range of window sections in steel and aluminium, as well as a curtain wall system, which complied with all the prescriptions and regulations of the time. BN was responsible for some of the most famous post-war metal façades in Brussels, such as the Madou tower in Saint-Josse-ten-Noode (Robert Goffaux, 1963-1965) and the Cité Administrative de l’État in Brussels (Hugo Van Kuyck, Marcel Lambrichs et al., 1958-1968). 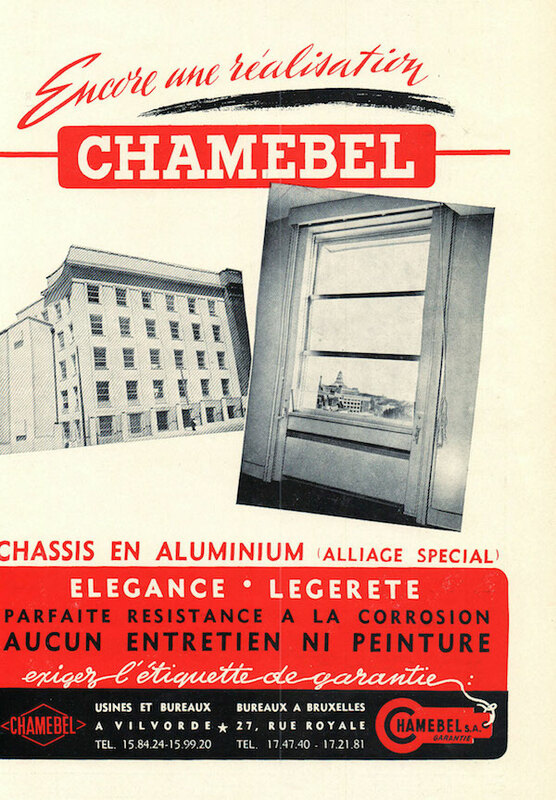 Founded in 1933, Chamebel (CHAssis MÉtalliques BELges) is one of the oldest factories for metal window frames in Belgium. According to a 1937 brochure, it was the only Belgian company equipped to manufacture steel window and door frames, and therefore responsible for three quarters of all steel windows installed in Belgium at that time. The company’s main products in the post-war period were door and window frames, curtain walls, façade cladding, and roof elements in steel and aluminium. The company, located in Vilvoorde, had its own design service, research department, laboratories, and testing facilities, and employed over 1,000 people around 1960. While products of the interwar period were mostly in steel, Chamebel started using aluminium immediately after the Second World War. As they stated in 1944, the new hollow section in aluminium of 36 mm had a higher resistance to bending and torsion than the regular rolled and folded sections of 36 and 45 mm. 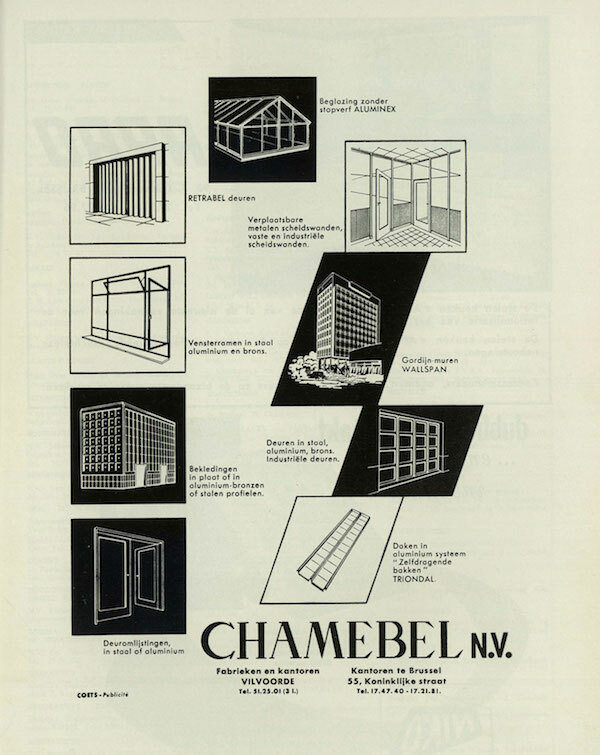 In a company catalogue (ca 1960), Chamebel discussed in detail its production and installation process for both aluminium and steel window frames, in addition to other popular products like the Wallspan system. The aluminium sections, made by extrusion, were welded electrically, anodized, and mechanically polished. For fixed window frames, usually simple sections were used, while the moveable frames were made from hollow, tubular sections. On site, the aluminium frames (wrapped in plastic to protect them from staining) were mounted into openings in the masonry: casement windows needed a 5 cm groove or recess, while 10 to 12 cm was necessary for vertical sliding sash windows. The interspace was filled with mortar and a bituminous joint, after which a line of mastic was applied. The edges of the glass panes were sealed with mastic and usually a glazing bead. Glass panes of 3 to 25 mm could be incorporated in most standard sections. The two main series at that time were M45 and T50: in comparison to the 1944 section, not only was the cross section larger, increased from 36 mm to 45 or 50 mm, it also had more intricate detailing. Each series consisted of approximately 20 standardized sections (including also glazing beads and connecting pieces), with which all types of windows (rotating, sliding, pivoting, etc.) could be created. The sections of the M45 series were 2 mm thick, had a double rabbet, and were designed for single glazing up to 9 mm thick. The T50 series, designed for double glazing, was more advanced: made with aluminium sections 2 or 2.5 mm thick, the frames could be larger and the rabbets were grooved to hold a plastic sealing joint. As for steel window frames, the processes for fabricating and installing them differed little from those for aluminium. Steel was protected by metallization, Parkerizing, or painting. They came in standard sizes, 25 or 36 mm high, and had far fewer details than the aluminium series. The standard series were sufficient for windows of 0.75 m²; for larger windows, the cross sections needed to be reinforced with an extra section. The elaborate list of Chamebel’s realisations included a number of architectural icons in Brussels such as the Postcheque Building (Victor Bourgeois, 1937-1946); the National Bank (Marcel Van Goethem, 1946-1954); the ULB auditorium Emile Janson (Marcel Van Goethem, 1956); housing complexes for the Foyer Bruxellois in the Rue Haute, Rue du Meiboom, and Rue des Tanneurs (by Charles Van Nueten, Henri Jacobs and J.M. Morant, respectively, between 1955 and 1957); the Westbury Hotel (Robert Goffaux, 1962-1963); and the Tour du Midi (Yvan Blomme et al., 1961-1966). In the approximately 160 journal articles on post-war houses in Brussels that mention the materials used, one out of four refers to the window frames. Yet apart from window type or material, the descriptions contain very little technical or formal details. For instance, there was not a single mention of the number of rabbets or the way in which the metal window frames were protected. A few companies were mentioned (for instance Chamebel and Francotte), as well as some particular window systems (Duyver, Techramo, and Perspective). Acknowledging the limitations of this data source and the hardly-representative sample of only 29 cases of which some detail is known, one can nevertheless discern a few trends. Overall, wood remained a very popular material, used in 15 of the cases, in the 1950s and 1960s. Wood species that were used included Iroko or Kambala, pine, oak, teak, Afzelia, Sipo Mahogany, and Meranti. Wood was closely followed by aluminium. Steel was used in only a couple of cases; the same goes for the combination of wood (for the fixed frames) and metal (for the moveable elements). Concrete, PVC, bronze, copper, stainless steel, and cast iron were not mentioned. More remarkable than the seemingly equal popularity of wood and aluminium was how the use of these materials continued over the years. While aluminium was cited the most during the 1950s, there was a turn in 1960, after which almost only wooden window frames were mentioned. The reason for this (maybe coincidental or illusory) change is unknown. Had aluminium lost its novel or innovative character by 1960, so that it did not need to be mentioned explicitly anymore? A quote from a contemporary article suggests that aluminium was considered a customary material as early as 1953: the private house of architect Jean Dumont in Brussels was said to prove the fact that a practical, modern, and aesthetic house could be realized with traditional building materials and techniques – in this case the building materials included aluminium alloy window frames. 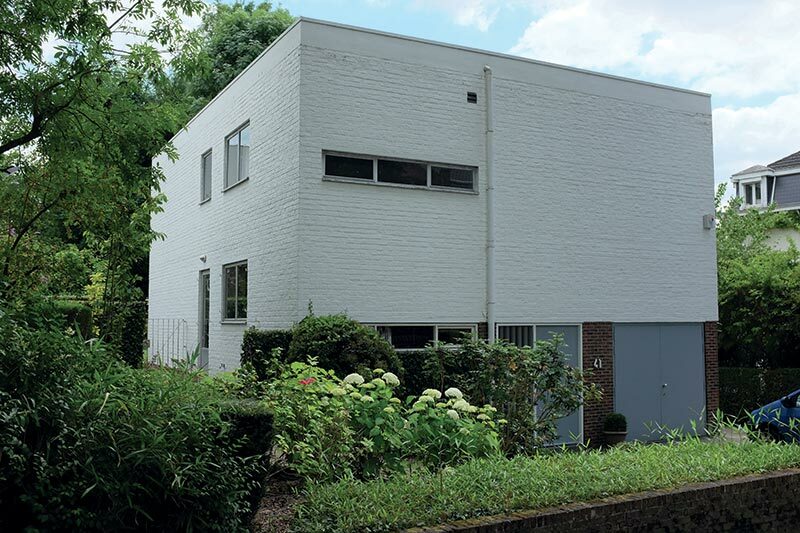 Another somewhat remarkable application of aluminium windows was in a terraced house in Anderlecht designed by architect Simon Hermans, published in 1960. The window frames of the front façade were aluminium, while those in the back façade were made out of steel. The writer did not give a reason for this difference. Maybe aluminium windows were too expensive to apply throughout, and so were put on the aesthetically more important front façade. While no example of a genuine curtain wall on a residential building was discovered in the journals searched, there were some examples of large façade panels, reaching from floor to ceiling and stretching out between two columns or loadbearing supports. These were found, for example, in the medium-rise apartment buildings Van Ooteghem in Evere (Willy Van Der Meeren), Clarté in Ixelles (J. Van Malderghem), and an apartment building in Ixelles (Michel Boelens), respectively published in 1954, 1959, and 1963. In addition to these, there were frequent references to (smaller) window frames filled with transparent glass panes and opaque (sandwich) panels like Glasal. Go to the image archive or Read "cladding and sandwich panels"